Diana Brenner, an award-winning architect and president of the largest woman-owned architectural firm in Indiana, in December joined Maui Mastermind, a national business coaching community. “As an architect, I have been thoroughly trained in my craft,” Brenner said. “However, architectural school offered no expertise in actually running a business. Brenner Design Incorporated is a full-service architectural and design firm that specializes in relocation, renovation and rebranding for commercial and public sector clients. “We provide turn-key project management and trusted advice,” Brenner said. Brenner is a leader in the Indianapolis chapter of the National Association of Women Business Owners and has been nominated for a sHero award, which will be announced in March. She has been a NAWBO member since February 2003. Santa Barbara Members Find the Common Cause In the "Power Of You"
Description Page: Santa Barbara Members Find the Common Cause In the "Power Of You"
Here are the 8 tips David Finkel wished he would have known back when he sold his first real-estate business over 10 years ago. Each year an elite handful of entrepreneurs, investors, and committed wealth builders meet in Maui for a transformational five and a half day mastermind experience, the Maui Mastermind Wealth Summit. During the summit, attendees connect with an upgraded peer group to support and inspire them as they strive to be more successful in all the ways that count. Listen in as our COO, Patty DeDominic, talks with Tough Talk Radio about Small Business Solutions. How do business owners flourish without losing their minds? 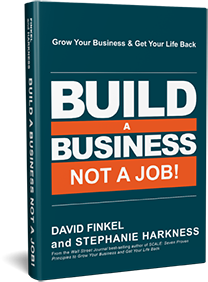 Read about it in “Business Coach and His Maui Mastermind Team Teach Entrepreneurs How to Flourish without Sacrificing Their Personal Lives”. TIME. DON’T WAIT - STOP PROCRASTINATING NOW! Patty DeDominic writes about the tricks to stop procrastination in “Time. Don’t Wait–Stop Procrastinating Now!” featured on the Evan Carmichael website. Description Page: TIME. DON’T WAIT - STOP PROCRASTINATING NOW! Read a featured guest article from our COO, Patty DeDominic titled “Better Together: Essentials for a Successful Business Partnership” on May 9. The most essential “in the trenches” key to execution is to raise the accountability bar inside your company so that each team member feels like what he or she does is seen, noticed, and applauded. Think of how much time and money your company spends on meetings. Yet so few executives know what it takes to make meetings crisp and productive. David Finkel gives 7 tips to make your meetings more effective. David Finkel shares one of the most important lessons with respect to managing cash flow: The faster you collect from your customers, the easier it will be to manage your cash flow. Listen in as talk radio hosts interview Patty DeDominic, our COO, from Gainesville, FL on April 18 about the Maui Mastermind ideas and programs. An article was recently written by Maui titled- “Business Coach and His Maui Mastermind Team Teach Entrepreneurs How to Flourish without Sacrificing Their Personal Lives”. Increase Your Cash Flow by Getting Paid on Time! Description Page: Increase Your Cash Flow by Getting Paid on Time! Learn more about managing your time-“4 Ways to Better Manage Your Time as a Business Owners” from Patty DeDominic. Description Page: Til Death Do Us Part? A great read; “Business Coach and his Maui Mastermind team teach Entrepreneurs How to Flourish without Sacrificing their personal lives“ talks about gaining your life back!